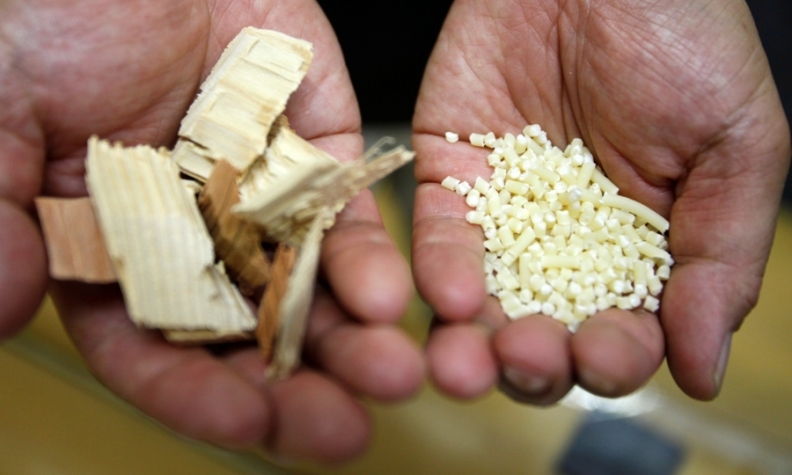 Kyoto University Professor Hiroyuki Yano, who is leading the research into using wood pulp fibers to make lighter auto parts, shows wood chips, left, and fibers that are chemically treated before they are converted into cellulose nanofibers as they are kneaded into plastics and formed into pellets. KYOTO, Japan -- The global push among carmakers to make ever lighter vehicles is leading some auto suppliers in Japan to turn to what seems like an unlikely substitute for steel: wood. Japanese researchers and auto component makers say a material made from wood pulp weighs just one-fifth of steel and can be five times stronger. The material -- cellulose nanofibers -- could become a viable alternative to steel in the decades ahead, they say, although it faces competition from carbon-based materials, and remains a long way from being commercially viable. Reducing the weight of a vehicle will be critical as manufacturers move to bring electric cars into the mainstream. Batteries are an expensive but vital component, so a reduction in car weight will mean fewer batteries will be needed to power the vehicle, saving on costs. "Lightweighting is a constant issue for us," said Masanori Matsushiro, a project manager overseeing body design at Toyota Motor "But we also have to resolve the issue of high manufacturing costs before we see an increased use of new, lighter-weight materials in mass-volume cars." Researchers at Kyoto University and major parts suppliers such as Denso, Toyota's biggest supplier, and DaikyoNishikawa, are working with plastics incorporated with cellulose nanofibers -- made by breaking down wood pulp fibers into several hundredths of a micron (one thousandth of a millimeter). Cellulose nanofibers have been used in a variety of products ranging from ink to transparent displays, but their potential use in cars has been enabled by the "Kyoto Process," under which chemically treated wood fibers are kneaded into plastics while simultaneously being broken down into nanofibers, slashing the cost of production to roughly one-fifth that of other processes. "This is the lowest-cost, highest-performance application for cellulose nanofibers, and that's why we're focusing on its use in auto and aircraft parts," Kyoto University Professor Hiroaki Yano, who is leading the research, told Reuters in an interview. The university, along with auto parts suppliers, are currently developing a prototype car using cellulose nanofiber-based parts to be completed in 2020. "We've been using plastics as a replacement for steel, and we're hoping that cellulose nanofibers will widen the possibilities toward that goal," said Yukihiko Ishino, a spokesman at DaikyoNishikawa, which counts Toyota and Mazda Motor Corp among its customers. Automakers are also using other lightweight substitutes. BMW uses carbon fiber reinforced polymers (CFRPs) for its i3 compact electric car as well as for its 7 series, while high-tensile steel and aluminum alloys are currently the most widely used lightweight options because they are cheaper and recyclable. Yano said he was inspired in his research by a photo of the Spruce Goose, a cargo plane made almost entirely of wood in 1947 by U.S. billionaire entrepreneur Howard Hughes. At the time, it was the world's largest aircraft. "I thought that if Howard Hughes could find a way to use wood to build a massive plane, why not use wood to make a material that was as strong as steel," he said. The cost of mass producing a kilogram of cellulose nanofiber is currently about 1,000 yen ($9). Yano aims to halve that cost by 2030, which he says will make it an economically viable product, since it would be combined with plastic, and so competitive against high-tensile steel and aluminum alloys, which currently cost around $2 per kg. Industry experts anticipate that carbon fiber prices will fall to about $10 per kg by 2025. Analysts say high-tensile steel and aluminum will be the more popular alternative for many years to come, considering partsmakers would need to overhaul production lines and figure out ways to fasten new materials like cellulose nanofiber onto other car parts. Anthony Vicari, an applied materials analyst at Lux Research in Boston, said it "would be a big deal" though if Yano's projections prove to be correct. But for now, it remains "a very big 'if'," he said.